Low income tax rates first put in place under Republican former President George W. Bush are due to expire at the end of the day on Monday – the last day of 2012. Obama said that failing to reach a deal would have a negative impact on financial markets. “If people start seeing that on January 1st this problem still hasn’t been solved, that we haven’t seen the kind of deficit reduction that we could have had had the Republicans been willing to take the deal that I gave them … then obviously that’s going to have an adverse reaction in the markets,” he said. The problem with this statement is that U.S. markets have already adversely reacted to going over the so-called “fiscal cliff”. Following the outcome of the November 6, 2012 national election, which ensured that President Obama would remain in office and the higher tax rates he seeks to impose upon investment income would go into effect on January 1, 2013, major shareholders at several hundred U.S. companies have acted to avoid those higher taxes by either moving up dividend payments into 2012 or by paying out special dividend payments before the end of the year. Since November 15, 2012, which marks the beginning for when U.S. companies began announcing changes in their dividend payments to avoid President Obama’s higher taxes on this kind of investment income in 2013, roughly 4.6% of all the funds being set aside to pay dividends in the first quarter of 2013 have been moved up to be paid out in 2012 instead. With a total adjusted market capitalization of $12.53 trillion on December 28, 2012, the S&P index value of 1402.43 per share indicates that there are 8.93 billion shares outstanding in the market. 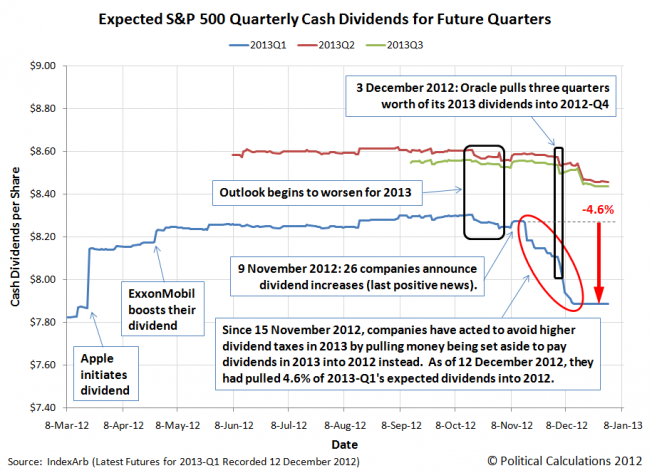 In the period from November 15, 2012 through December 12, 2012 which saw the majority of all dividend policy changes reacting to 2013’s guaranteed higher taxes on investment income, at least 37.8 cents per share has been pulled out from the first quarter of 2013 to be paid out before December 31, 2012 instead. That works out to be a shift of nearly $3.4 billion dollars that will be taxed at 2012’s dividend income tax rate of 15% rather than 2013’s post-fiscal cliff dividend income tax rates, which are set to be taxed at the same rates as for ordinary income. Going by the IRS’ income tax statistics for 2009, the most recent year for which data is available at this writing, we estimate that over two-thirds of all ordinary dividends being paid out in 2013 would be subject to the maximum dividend tax rate of 43.6%. The massive difference between the maximum dividend income tax rates from 2012 to 2013 and the desire to avoid 2013’s much higher dividend income tax rate is the motive for the actions taken by the S&P 500’s dividend paying companies. The bottom line is that U.S. markets have already reacted to going over the so-called “fiscal cliff” – any adverse market activity now would be solely due to a worsening business outlook for the nation in 2013.